Horizontal Seam Myth Dispelled By GSI? Ever since I began working in the geosynthetics industry in 1990, horizontal seams in geomembrane were strictly forbidden on slopes greater than 10-20%. This criterion was largely accepted as gospel throughout my career, no matter where I worked (many different states within the United States). As such, no horizontal seams presented challenges for designers, owners, installers, and QA personnel trying to balance cost and quality. The results often produce a nice, uniform looking slope while the floor liner resembled a patchwork quilt. The smaller remnants were seamed in on the floor wherever they fit, thus increasing the number of seams, intersections and repairs (all potential leak locations) on the very area most likely to be in constant contact with leachate (at least in landfills). An occasional workaround, primarily on caps but still unacceptable on bottom liners, was putting in a seam angled at 45 degrees. This still resulted in challenges of trying to mitigate material waste and using remnants in practical areas as the guidelines for putting in these angled seams often require a full length (anchor trench to floor or top to bottom) panel between any runs containing an angled seam. In some cases, angled seams simply had to be staggered due to project constraints. Shingle upper over lower sheet, which not only promotes proper runoff, but also minimizes the chance of the seam being put in peel mode. Staggering of horizontal seams on the side slope so that they do not line up. My understanding of this would be that you could have horizontal seams in each run from top to bottom, provided they do not align. Horizontal seams should be placed as close to the bottom of slope as possible to avoid stresses on the seam that would be more likely to occur closer to the top of the slope. The article references that per GRI-GMI9a, “…peel strength is 62% of the unseamed sheet tensile strength.” In looking back on GRI-GM19a the 62% value is the value for peel strength of an HDPE extrusion weld. Fusion welds are approximately 72% of unseamed sheet tensile strength per GRI-GM19a for HDPE. Is this article suggesting that horizontal seams be produced with extrusion welds or simply using worst case scenario? How do repairs play into the horizontal seam scenario? When patches are required (most intersections), there will be one side of the patch where the lower sheet will be shingled over the upper sheet regardless of whether the patch is placed over or under the existing geomembrane prior to welding. Allowing horizontal seams on slopes will result in more repairs on the slopes. Does this apply to all geomembranes or just the polyolefins mentioned in the article, and are the results the same between all the polyolefins? The values mentioned in the article directly correlate to HDPE geomembranes in referencing GRI-GM19a and GRI-GM13 but it is hard to discern a correlation in either LLDPE or fPP at quick glance. Are there any limitations of slope angle to where horizontal seams should not be used? You know it will quickly arise on your project before you can blink an eye -can multiple horizontal seams/panels be placed in the same vertical run (i.e. a slope distance of 100 feet uses a 75’ panel a 15’ panel and a 10’ panel)? How does the interface friction play into this? Would the same be true of a smooth geomembrane, a lightly textured geomembrane, and a heavily textured geomembrane on the same slope? Would this apply for all manufacturers, or will it vary by manufacturer because not all sheet is created equal (both domestically and overseas)? Does anyone else have any research they can provide on the issue? I am very interested to hear your take on allowing horizontal seams on slopes in geomembranes! 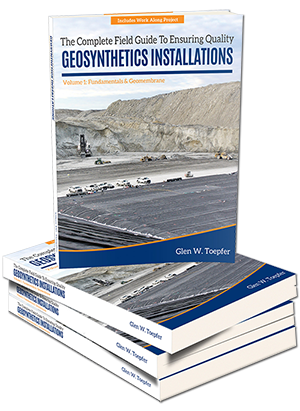 Glen's field guide for geosynthetic installations is now available for purchase! If you'd like to be notified when I update my blog, use this sign up form. Cheers! There is a paper at the IGS conference in Korea later this year that presents more info on this subject. 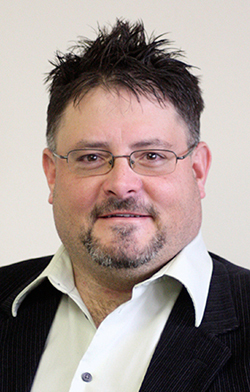 The paper is titled “Repairs in exposed geomembrane liners”, by Boyle, Gassner and Gu. I think there is a place for some seams on slopes but probably not to throw out the accepted practice. CQA Solutions is a construction quality assurance firm serving the waste management, energy, mining, oil & shale and dams & impoundment industries. SuperTek is a real-time data collection and validation system for geosynthetics installations that saves time, reduces errors and increases your bottom line. © 2019 Uncontained. Copyright CQA Solutions, Ltd.